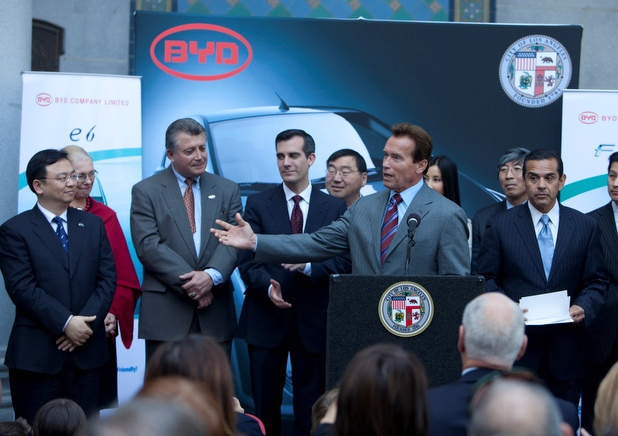 Governor Schwarzenegger joined Los Angeles Mayor Antonio Villaraigosa and officials from Chinese manufacturer BYD Auto Company Limited (BYD) to announce BYD, a leader in electric and hybrid vehicles and other renewable energy products, will locate its North American headquarters in Los Angeles. Click here to read more. The above photo was taken at City Hall in Los Angeles, California April 30th 2010. BYD’s Los Angeles headquarters will be responsible for sales, marketing, and research and development for its automobiles and energy products, which include solar panels, LED lighting systems and home and grid level energy storage units through BYD’s unique iron-phosphate batteries. Like California, BYD has been a leader in green; selling the world’s first mass-produced plug-in hybrid vehicle, the BYD F3DM, in 2008 and introducing the first electric car independent of specialized charging stations in the world, the e6, in 2010 to the city of Shenzhen, China. In Above PHOTO: From left to right: BYD Chairman Chuanfu Wang, California Labor and Workforce Development Agency Secretary Victoria Bradshaw, Los Angeles City Attorney Carmen A. Trutanich, Los Angeles City Council President Eric Garcetti, Governor Arnold Schwarzenegger and Los Angeles Mayor Antonio Villaraigosa.